On 1 June 2015 a group of scientists left the Hans Hoheisen Wildlife Research Station (adjacent to Orpen gate, Kruger National Park) to drive 6 hours to OR Tambo International Airport. I took as many PHOWN photos as I could while generally travelling at 120km/h (I wasn't driving!). Nests were missed in a few photos and these were not uploaded, and other nests were seen too late to photograph. While this survey was not complete (some nests missed), it is representative of some species changes and densities. The first 3 records were of Red-headed Weaver nests on telephone wires. These were followed by Village Weaver and Red-billed Buffalo-Weaver nests, and then from Ohrigstad it was solely Southern Masked Weaver nests. The highest density of nests was along the N4 near Middelburg, all the nests being on the southern side simply because new lanes have been graded on the other side. For some PHOWN records I checked the Google Streetview imagery. 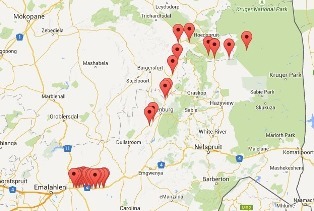 Sometimes nests were present in 2009/2010 when streetview started in South Africa, but often no nests were present. Some routes had a streetview repeat in Jan 2015 (especially along the N4) and it was interesting to see the changes in vegetation (and even colony size). Note the green maize fields in Jan (streetview) compared to the same spot in June in the photos below. The purpose of this trip was to see the facilities on the Hans Hoheisen Wildlife Research Station, University of Pretoria. Les Underhill and I flew to Jhb on 30 May, and drove to the site on the next morning. Thanks to Darrell Abernethy, Richard Burroughs and Greg Simpson for hosting us!